Guests love visiting Smoky Mountain Outdoors! 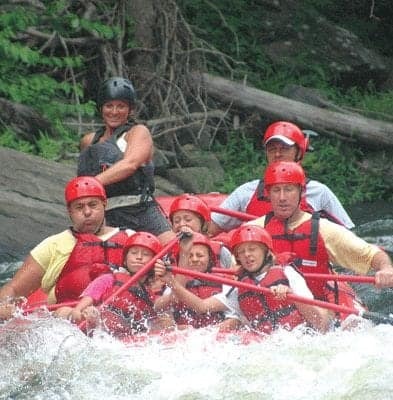 Whether you are looking to go whitewater rafting or kayaking near Gatlinburg, we have adventures for everyone! Kids and adults are both welcome at Smoky Mountain Outdoors and our reviews show that everyone has a great time with us! Take a look at our recent reviews below. Well run operation with great staff. We had an ex-marine combat veteran at the helm so felt safe the whole time. Water was a bit cold, but the rapids and excitement more than made up for it. It’s a great day trip away from the normal touristy stuff. What an amazing place! Came here with friends during our spring break. Our tour guide Stanley showed us a great time. The entire process was very well organized. Kudos to the staff! We went in March when it was still chilly outside. We were assigned a guide – Stanley. He made the trip quite fun and enjoyable for us and gave us good directions to hit all the rapids during out trip. All in all, it was a great experience. Fun atmosphere filled with excitement! Wow what a fun and enjoyable time! Right when we arrived the raft guides greeted us and were very friendly and fun to be around. A raft guide named Randy was our guide, he was very informative, patient, and made the trip very enjoyable! The raft trip lasted around 2 hours. Right off the bat you better be hanging on, 16 seconds into the trip we went through a class 4 rapid! The adrenaline rush was fantastic! As long as a person listens to their guide I don’t see it being dangerous. I highly recommend bringing insulated water shoes for the colder season raft trips. I wore sandals and it was a bit uncomfortable because of the cold water and you have to position your foot between the rubber walls of the raft for safety purposes. I highly recommend this company. Overall, really great trip. Winner of TripAdvisors Certificate of Excellence Year After Year!